I’m frequently asked how to pressure cook frozen chicken breasts. 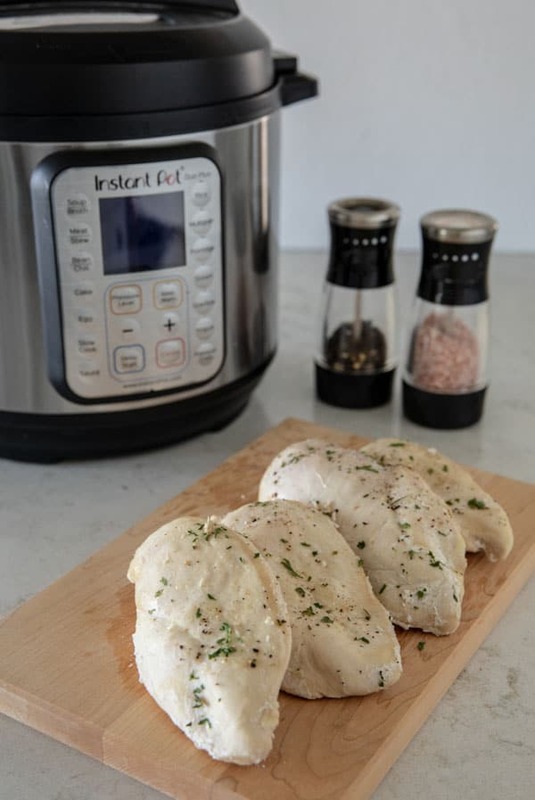 Chicken breasts are so versatile; they’re a great base for lots of delicious meals—and when you have a pressure cooker, frozen chicken isn’t a problem! I’m sure many of you are like me and when dinner time rolls around, I find myself wondering what to cook for dinner. That’s why I almost always have a big bag of frozen Costco chicken breasts in the freezer. Chicken cooked from frozen is excellent in recipes that call for cooked chicken, to add protein to your salads, or just to freeze in ready-to-use portions. 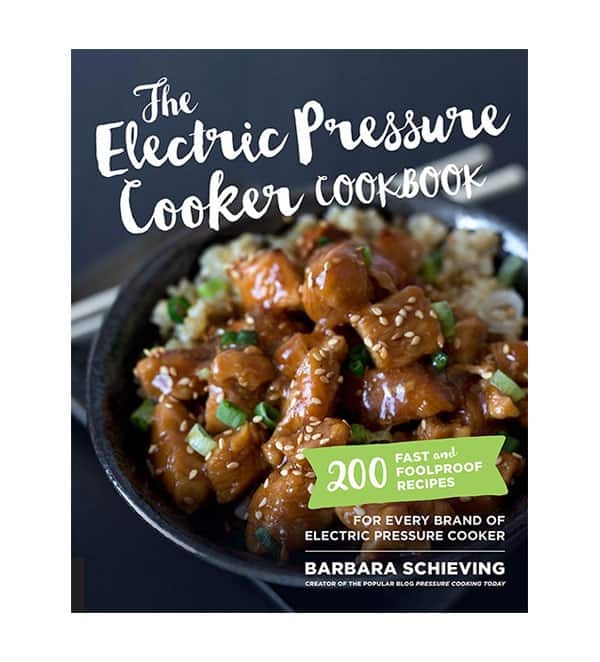 In my cookbook, The Electric Pressure Cooker Cookbook, I give lots of tips about pressure cooking meats from frozen. I prefer not to cook large cuts of meat, like roasts, from frozen. 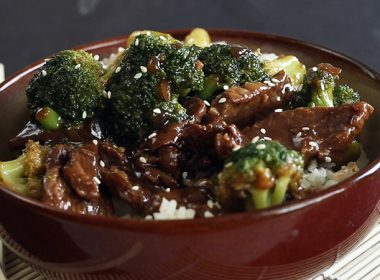 Frozen meat doesn’t brown well, doesn’t cook as evenly, and doesn’t absorb marinades. However, this doesn’t mean you have to scrap cooking and order takeout if you’ve forgotten to thaw your chicken in advance! Chicken is easy to cook from frozen, and you’ll get great results. Here are my go-to methods for getting tender, moist chicken cooked from frozen chicken breasts. This is my very favorite way to quickly take chicken breasts from frozen to recipe-ready—I use this method at least once a week! If your recipe calls for diced, thawed chicken, but you didn’t defrost the chicken breasts in advance, there’s an easy fix! Pour 1 cup water into your pressure cooking pot and place a trivet in the bottom. Balance the frozen chicken breasts on the trivet, stacking crosswise if necessary. Lock the lid in place. Select High Pressure and 1 minute cook time. 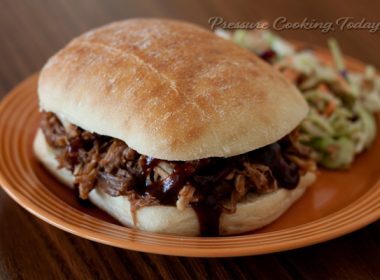 When the cook time ends, turn off the pressure cooker and use a quick pressure release. Remove the chicken from the pot, dice it into small pieces, and continue with the recipe as directed. 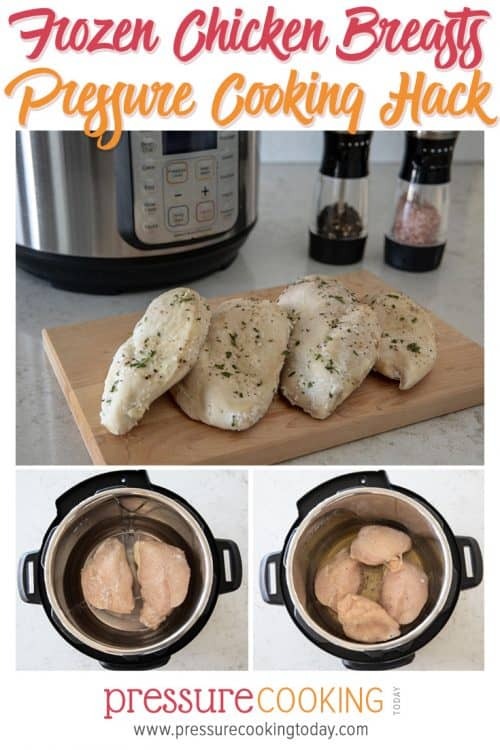 With this method, the chicken will cook a little bit on the outside, but the inside with be thawed, easy to dice, and ready to use in your favorite pressure cooker recipes. You can also use this method to thaw your chicken breasts and then coat the breasts with your favorite barbecue sauce and grill them on the barbecue. If you’re not going to dice the chicken to use in a recipe or finish the chicken on the grill, then you’ll need to decide if you want sliceable chicken or tender, fall-apart shreddable chicken. Sliced breasts need a shorter cook time than shredded breasts. One of the most important parts of cooking from frozen is determining the right cook time. This cook time will vary based on the size and thickness of the breasts, as well as whether you plan to slice or shred the finished chicken. When cooking from frozen, do your best to select chicken breasts that are similar in size and thickness. To determine a cook time by weight, use a food scale to determine how many ounces each breast is. For sliceable chicken, I’m a big fan of the Rich Lum method, which recommends adding 1 minute of cook time for each ounce of chicken. If you’re cooking multiple breasts, use the average weight. For shredded chicken breasts, a good rule of thumb is add 3 to 4 minutes to the cook time above for shreddable chicken breasts. Some people prefer to cook their chicken on a trivet so that it steams. Others prefer to cook their chicken in a liquid to flavor the chicken as it cooks. My preference is to use a trivet or a steamer basket when the desired end-result is gently cooked chicken. Use what method works best for you! To cook on a trivet, place 1 cup water or cooking liquid in the bottom of the pressure cooking pot, then place a trivet in the bottom. Carefully lay the chicken breasts on a trivet. If you’re cooking multiple breasts, you can stack them crosswise on top of each other or use a second trivet to further separate your meat—again, choose works best for you. To cook right in the pot, place 1 cup of cooking liquid (water, broth, juice) in the bottom of the pressure cooking pot. Place the chicken breasts in the cooking pot directly in the liquid, overlapping as little as possible. While many people recommend using a natural pressure release for meats, with chicken I prefer to allow the pressure to release naturally for just 5 minutes, then finish with a quick pressure release. Chicken cooks so quickly that I’ve found it can easily become overcooked with a longer pressure release. However, I believe that there’s no right or wrong way to pressure cook. If you prefer a natural pressure release with your chicken, that’s fine—just reduce the High Pressure cook time by a few minutes until you find the sweet spot. 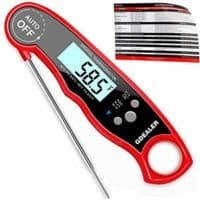 I highly recommend getting in the habit of checking the temperature of pressure cooked foods. This is especially important when cooking from frozen, since frozen meat has a tendency to not cook as evenly. Frozen chicken breasts should reach an internal temperature of 165°F at the thickest part of the meat. If your meat hasn’t reached your desired temperature, lock the lid in place and cook at High Pressure for a few minutes more. 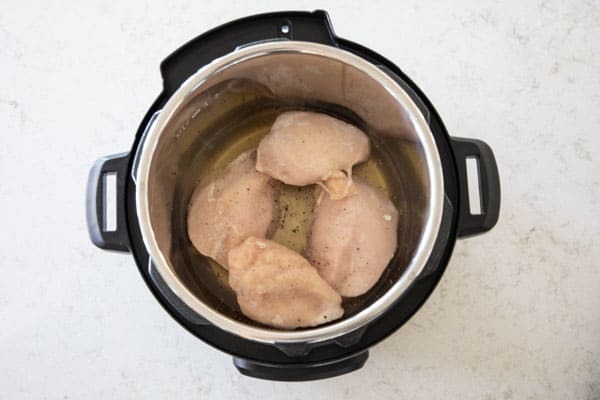 Carefully place the frozen chicken breasts in bottom of the the pressure cooking pot, overlapping as little as possible. Add 1 cup desired cooking liquid to the pressure cooking pot and any desired seasonings. Lock the lid in place. Select High Pressure and 7 minutes cook time. (Add 2 or 3 minutes if you want shreddable chicken.) 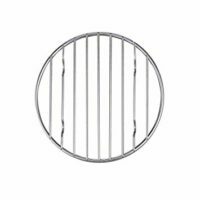 When the cook time ends, allow the pressure to release naturally for 5 minutes, then finish with a quick pressure release. Use an instant-read thermometer to verify each chicken breast is at least 165°F in the thickest part of the breast. 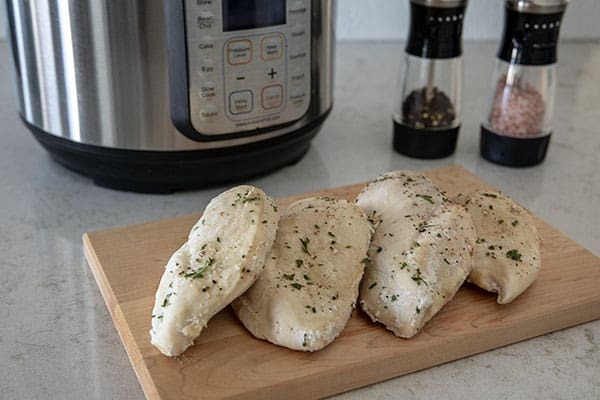 Remove the cooked-through chicken breasts to a platter; if any chicken breasts have not reached that point, return the lid and cook at High Pressure for another minute or two, then finish with a quick pressure release. 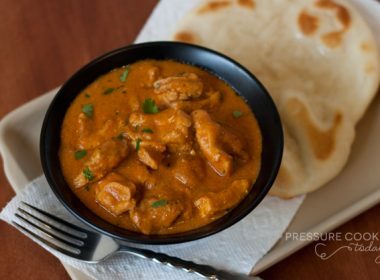 Have you tried making chicken from frozen in the pressure cooker? What works best for you? Do you have any tips you’d like to share? Let me know! what good is this if I have an old pressure cooker NOT an instant pot? 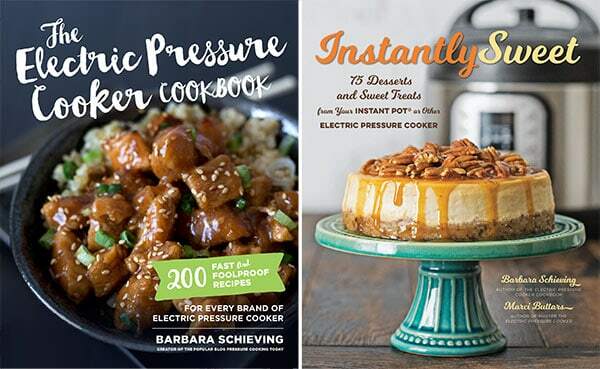 Instant Pot recipes will work in your stovetop pressure cooker as well. The time doesn’t start counting down on the Instant Pot until it’s reached pressure. So bring your pressure cooker to pressure the way you normally would and then reduce to the heat to maintain pressure and start a timer. Your cook time will be the same except for long cook items, then you’ll want to reduce the cook time by about 10%. Hi Nan – do you have a non-stick pot or a stainless steel pot? A couple of things you can do – use a cleaner like Bar Keepers Friend, or often if I have a stuck on mess, I’ll pressure cook the empty pot with just water for a few minutes and that makes it easier to clean. Cut a lemon in half, dip it in a plate full of salt, scrub away at the pan. Rinse and then wash with soap and water. Gets my instant pot shiny clean every time! Brilliant! Just the post I needed today. 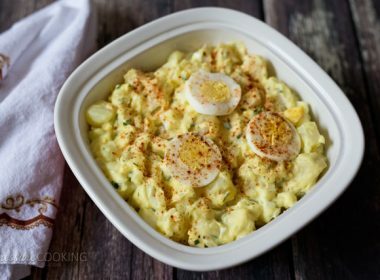 I love quick and easy dinners like this! I did 2 breasts this way and found them “squishy”. The temperature was at the right degree to be done. What would I do different to make them not squishy? Hi Nancy – by squishy do you mean watery? Sauteing after pressure cooking in a skillet is a great way to add flavor and remove the squishiness. When I’m cooking meat like a roast and release the pressure remove the roast and add the veggies do I add water again? Hi Sherry – there will be lots of juices/liquid in the pot from the roast, so there’s no need to add water, just cook the veggies in the juices in the pot. Can I cook a frozen roast with potatoes and other veggies? What about the other frozen meats like roasts and stuff? 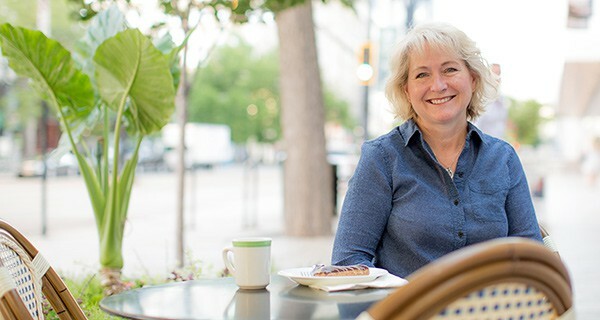 Hi Jaime – for large cuts of frozen meat, add about 5 minutes per pound to the recipe you’re using. This is genius! I always have that pack of frozen Costco chicken breasts in my freezer, and always forget to thaw. I will definitely be trying this out!! Thanks for the tip. I buy the packs of organic chicken breasts at Costco and keep them in the freezer. I have been using the microwave for thawing them, but it can be messy and also leave them rubbery (they partially cook while thawing). Today I used the IP and it was so much easier; I also made your Hawaiian BBQ chicken and it was great. I’m so glad you gave it a try. So much easier and a much better result. Thanks for sharing Tony! Those look dry and virtually tasteless. Hi Ed – I think you missed the point of the article. Very helpful. 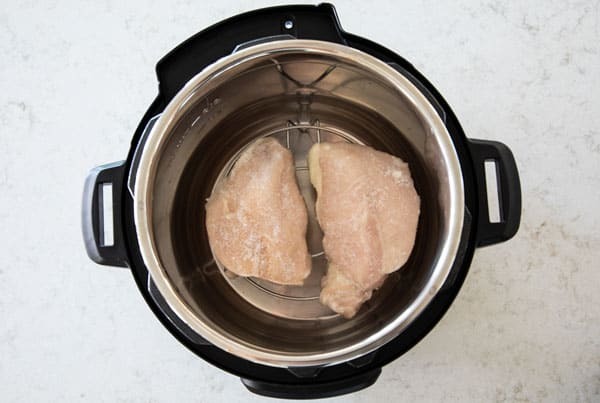 How about a companion article on pressure cooking chicken breasts that have been thawed? Thanks! I don’t recommend just cooking chicken breasts in the pressure cooker. You really need to start with a recipe in mind to infuse the chicken with flavor. 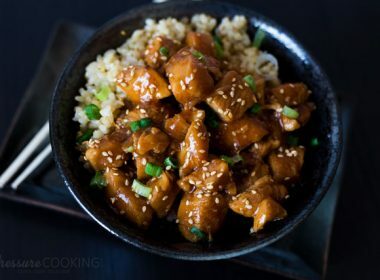 I did a roundup https://www.pressurecookingtoday.com/best-pressure-cooker-instant-pot-chicken-recipes/ with tips and recipe links that will help people get started. That was an amazing post! So much helpful info. I love the dicing trick. Thanks!